Have you been searching for a fun game that is challenging enough to stay interesting, but that does not fill your brain with mindless knowledge? 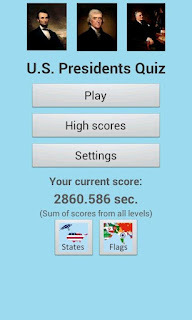 U.S. Presidents Quiz for Android is just that. Your mind will stay sharp and so will your competitive chops when you work your way through the 12 difficulty levels of the free android app. Start out on level one by recognizing the presidents when given only the order in which they held office. By level two you move on to trying to recognize the dates the president held office when given only his name his name, and level three requires matching a president's name to his official presidential portrait. 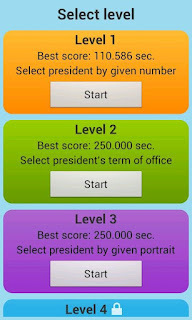 Levels 3 through 6 repeat the first three skills with increasing difficulty, and then level 7 takes it up a notch by giving the present's name and requiring the player to know the order in which he held office. In level 8 players are asked to give a president's name if given only the dates in which he held office, and level 9 requires knowledge of presidential birthdates. Levels 10, 11, and 12 repeat the previous three skills with increased difficulty. By the time a player works his way through all levels, not only will he be well versed in the history of U.S leadership, but this free app uses Swarm leaderboards to allow for comparison and competition among other players. This ensures the challenge never dies, and there is always something at stake, even if it is simply pride over having the top score. The reviews are great, so what are you waiting for? Download it today and see if you have what it takes to ace the U.S. Presidents Quiz.